The Los Angeles Dodgers today acquired catcher Ramon Hernandez from the Colorado Rockies in exchange for Aaron Harang and cash considerations. General Manager Ned Colletti made the announcement. 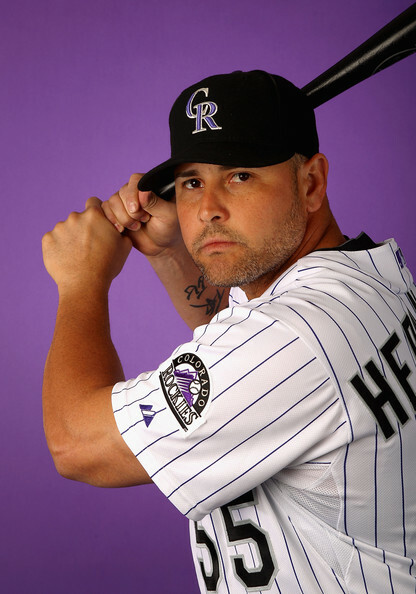 Hernandez, a 14-year Major League veteran, owns a career average of .264 with 166 homers, 751 RBI and 1,335 hits in more than 1,500 big league games with the A’s (1999-2003), Padres (2004-05), Orioles (2006-08), Reds (2009-11) and Rockies (2012). The native of Venezuela hit five home runs in 52 games for the Rockies last season, but averaged 118 games caught from 2000-11. His best season at the plate was 2006 with Baltimore when he established career highs in home runs (23), RBI (91), doubles (29), hits (138) and games played (144). Defensively, the durable backstop has caught nearly 12,000 innings over the course of his career and, among active players, only A.J. Pierzynski has caught more games and more innings than the 36-year-old. He was named to the AL All-Star team in 2003. Hernandez was the starting catcher for Oakland from 2000-2003, catching the big three of Tim Hudson, Mark Mulder and Barry Zito as the A’s went to the postseason in each of those four seasons. He led the AL in games caught following the 2001 and 2003 seasons and also made the Division Series with the Padres in 2005 and the Reds in 2010. In 2005, Hernandez hit .455 (5-for-11) with a home run in the NLDS vs. St. Louis. Hernandez was originally signed by Oakland as an undrafted free agent in 1994. Harang had not appeared in a game this season and went 10-10 with a 3.61 ERA in 31 starts for Los Angeles last season. The right-hander has a career record of 105-104 with a 4.19 ERA in 11 seasons with the A’s, Reds, Padres and Dodgers.